TOPZ restaurant franchise business opportunity. Free TOPZ restaurant business franchise information. TOPZ quick service, casual dining restaurant serves great tasting, fresher and healthier versions of classic American fast food. TOPZ products offer a skillful blend of low fat high quality ingredients and great tasting food. TOPZ quick service / casual dining approach offers the benefits of a “fast food” ordering process, prepared fresh to order and delivered directly to the guests table; like a full service restaurant. The menu items are. TOPZ focuses on nutrition and healthier eating habits by harnessing the trends of the future – meeting the demand of today’s consumer. TOPZ provides a clean and comfortable environment with minimal space requirements. TOPZ offers catering, takeout and delivery. TOPZ combines a diverse menu, gourmet products, within a clean and comfortable upscale environment. TOPZ satisfies the burger lovers desire to try to eat healthier. TOPZ cooks fresh to order. TOPZ buys the best products and prepares them with the quality normally found in full service restaurants. TOPZ has a different approach yet appeals to the mainstream consumer. In addition to our veto proof menu, TOPZ offers tasty low fat cookies and brownies. TOPZ upscale and comfortable environment is grounded in rich, tried and true earth tone colors presenting a more sophisticated ambiance. Strong graphics and upbeat energy surround our customers the moment they walk through the door. 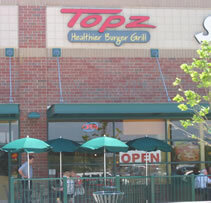 Customers know that TOPZ is more than a typical “fast food” restaurant. The interior burger chef mural creates a strong and lasting visual element, reinforcing TOPZ brand recognition. Franchising provides entrepreneurs with systems and support. TOPZ business strategy has been proven. We support our franchise partners with financing, site selection, hiring, training, operations, marketing and bookkeeping. The TOPZ concept is a ground floor opportunity. TOPZ powerful brand continues to receive worldwide press. There are great locations, territories and master franchise licenses available worldwide. TOPZ is an SBA approved franchisor. To learn more about the TOPZ restaurant franchise opportunity, simply complete the form below.